Martha Sequera greets patients from Eva's Village and the community who come to our Medical Clinic for primary care. The Clinic also provides dental and podiatry care for Eva's Village residential clients. ​"This population ages faster as a result of drug use and homelessness - health problems catch up with them at younger ages than average." ​"These patients are more than a diseased body, damaged organs, or disturbed minds; they are human and fearful. They are seeking not just medical help, but hope and reassurance." The Primary Care Medical Clinic at Eva's Village provides care not only to Eva's clients, but to local residents who are uninsured or underinsured - and it is one of the few free clinics in the Paterson community to offer this service to the public. In the same building on Jackson Street, the Dental Clinic offers primary and restorative dental care to clients in Eva's Village programs. In addition to escalating demand, medical staff sees an increase in the severity of illness due to the explosion in drug use, a rise in homelessness and unemployment, and lack of insurance in the community. These factors make for a "cauldron of illness," noted Dr. Henry Sherman, now a consultant who had volunteered at the clinic for 8 years. Nurse Practitioner Sara Thompson agrees: "Hypertension, hepatitis C, and diabetes are the most common conditions we treat," she said. Dental issues are common: "Lack of dental care, poor nutrition and drug abuse ravages the teeth. 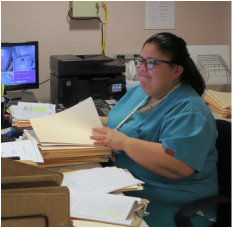 Dental services, including reconstruction, are very important in the rehabilitation of the formerly homeless and addicted," noted Janiene Diaz-Fasano, Clinic Administrator at Eva's Village. "Podiatry services are also in high demand. People sleeping outside often suffer from frostbite and infections complicated by drug use and diabetes. "If they can't walk, they don't eat," she explained. "So many patients are grateful for our service. They open up to us," Ms. Thompson remarked. It takes an "extra measure of awareness and empathy to work with this population," observed Dr. Sherman, who also teaches at NJ Medical School at Rutgers University. "It is important to understand these patients do not want to be abandoned. This is the most important expectation to satisfy and makes working here so unique. The need is so great." The commitment to improve health outcomes for underserved populations in our community has a long history at Eva's Village. The Primary Care Clinic had its beginnings in a mobile clinic set up in 1994, in response to the TB epidemic then raging in Paterson and other inner city neighborhoods. As demand grew, dental services were added in 2003 and the clinic moved indoors. In 2011, the clinics found a permanent home in Eva's administration building. Today the clinic has 7 exam rooms and a staff of 14, including both volunteers and paid staff. Volunteers play an essential role in our clinics, as they do in many programs at Eva's Village. Eight medical and dental professionals contribute time and talent to clinical care at Eva's. Ms. Thompson, who also teaches nursing at Felician University, often brings students to work with her in the clinic. "Some are apprehensive, but they will see things, like positive TB tests, they won't see in other places. Overall they have a positive experience," she noted. The clinics depend on the generosity of volunteers and donors committed to serving a vulnerable community. In 2014, the medical and dental programs received a generous 3-year grant from BD Corporation, which allowed extended hours of operation. We are grateful for donor and grant support, which is essential to maintain both of the clinics.